I am still annoyed that one of my ... uh, not childhood, no, “pre-midlife”? “Early adult”? ... heroes endorsed the Drumpfster. So I will write an unrelated blog post instead. First, China published what was accurately called “shocking trade data.” Add that to record capital flight, and the case for blowing part of the current account surplus on a giant prestige project in Nicaragua goes away. Second, the New York Times published a way overblown article about renewed Contra violence in Nicaragua. Now, the headline is overblown: Nicaragua is not facing a serious insurgency. (To be fair, when you read the article, it is pretty clear that nothing is going on.) But it should remind everyone that the people displaced to build the Red Canal could turn violent if not properly compensated. Kind of disappointing, but there you have it. Commentator Marc points out that HKND has now announced that it will postpone serious work on the Canal Rojo for another year. I have been saying for a while that this project is not going to happen unless the Chinese government makes a big and hard-to-hide financial commitment to the project. Right now, with China flirting with recession, such commitment seems further away than ever. Daniel Ortega is one of the animating forces behind the Nicaragua Canal. I always doubted that he believed the Canal would be built, but I did think that he expected his Chinese partners to go ahead with the subprojects. Well, Ortega just fired a shot across HKND’s bow. Exactly one week ago, President Ma Ying-jeou of Taiwan visited Managua. The two presidents of course met. And now it has leaked that President Ortega asked President Ma for Taiwanese official support in building a $500 million deepwater port at Monkey Point, Nicaragua, on the Caribbean coast. Well, nobody. I have only two points. First, the Monkey Point project has been percolating for a while. A Brazilian company rejected it three years ago. But the Nicaraguan government did not: last year, it put out for tenders on a design study for a highway to Monkey Point. Ortega was not talking off the top of this head; Hugo Chávez, he is not. Second, the whole thing is a message aimed at HKND: get serious about building something, or lose your concessions, constitutional amendment notwithstanding. But this message is not new. I have my doubts about whether the Gran Canal will ever be built. The Ma-Ortega meeting is probably not a sign that Daniel Ortega shares them. Although he should. The other big news, from yesterday, is that the head of the Panama Canal Authority, Jorge Quijano (pictured here) claimed the following: “I just came from China and builders told me that no state company is interested in financing the project.” But Mr. Quijano is self-interested. I have no doubt that he is telling the truth about what Chinese construction executives told him ... but I have rather more doubt that said executives really know Beijing’s thoughts on the matter. Heck, I doubt that Beijing knows Beijing’s thoughts on the matter. No word on who these German investors were. For what it is worth, Quijano thinks that a fourth set of locks big enough to accomodate the newest container ships could be built within 15 years for $17 billion. If that estimate is correct, I can’t see how in the name of God anyone can expect HKND to build the Nicaragua Canal in only five. In short, our official position remains unchanged: as cool as it would be, this project is not going to happen unless the Chinese government gets involved directly. It is a fine article, but I am wounded for all the obvious self-indulgent reasons. Hey, I get calls, but still, Mr. Plumer. Carlos and I quite literally wrote the book on the economic history of Isthmian canals. The article gets one historical detail wrong: fear of volcanoes did not scuttle U.S. plans for a Nicaragua Canal. It is true that volcanoes were used as one of the talking points to approve the Panama route, but it was not determinative. Goddammit, I get no respect from these young folks. I get to post this picture from ‘09, though, so not all bad. And the article really does a good job of covering most of the issues, so go read. Somehow I doubt that China will replace its imports from Europe and the Middle East with imports from the east coast of the Americas. I also doubt that in any realistic scenario export channels to the east coast of the United States (where Nicaragua and Suez really are substitutes) would be disrupted enough to make it worth the cost. But who knows? Like I said, the only way this thing gets built is if China backs it with sovereign wealth. Maybe they will risk it. That said, his estimate of the annual cost from closing the straits of Malacca, Sunda and Lombok (e.g., a complete blockade of all traffic through Indonesian waters) comes to about $10.5 billion. Shutting down the Bab-el Mandeb (the strait between Djibouti and Yemen) would cost about $13.4 billion. It is not clear what percentage of that would fall on Chinese consumers, producers or shippers. Let’s pull a number out of the sky and say that half the cost would fall on China one-way-or-another. Is a $50 billion canal in Nicaragua worth it as insurance? 30-year U.S. treasuries are yielding about 2.6%. Assuming that the canal comes in at cost and hits its projections it should be able to earn that through 2045. In that sense, maybe building it would have no opportunity cost, assuming that the money would have been otherwise plonked into American federal debt. The Gran Canal is still a terrible business proposition, but it would make cheap insurance against a possible $5.2 billion loss if Indonesia goes up in flames or some terrible conflict erupts across the Indian Ocean. Only ... there is still no sign of official Chinese backing for the Canal Rojo! All of these recent posts are attempts to make a convincing argument that my assessment is wrong and the Chinese government really will go all-in and build the thing with official money. I have been tinkering with my mickey-mouse financial model for the Nicaragua Canal. There is one way to make the Nicaragua Canal look like a decent investment: assume that it comes in on-time and on-budget (which we did) hits all its transit targets (which we did) and that the ships are all sized at the maximum possible (which we did) but also that the Nicaragua Canal will be able to raise average tolls at the same 6.8% rate that the Panama Canal has managed since the 1999 handover. If you believe that is possible, then you can manage a positive 6.1% return through 2030 and a respectable 12.2% return through 2040; breakeven happens in 2027. Do I believe that is possible? No. Do I believe that equity investors would accept that return? No. Do I believe that with enough debt equity investors might be persuaded to that they could get an acceptable return? Uh ... maybe. We come back to that whole government-involvement thing. The Nicaragua Canal will need a lot o low-cost debt to be viable even under the most heroic assumption. The project only flies if Beijing decides that it wants it to and is willing to back that up with government money. A whole lot of government money. Stephen Kaplan is just down the metaphorical hall. I should ask him if he thinks the Chinese government would want to back this ... and if so, why. One colleague of mine suggested “colonization” as a goal of its own. Me, I don’t think the Chinese government thinks that way, at least not in this hemisphere. So I am back to thinking that this project isn’t going to happen. I have no special insight into Chinese strategic thought. I have heard that it might be about secure access to Venezuelan oil or Trinidadian natural gas, but if I were in the Chinese leadership I would not think building the Canal Rojo a sensible way to attain that goal. Is there any Chinese strategic question to which the Nicaragua Canal is the answer? The Nicaragua Canal project is a little crazy. I’ve been canoodling around with some numbers and I just can’t make it work. The project is estimated to cost $50 billion. According to HKND, the Red Canal will have an average bottom width of 280 meters. (Page 5.) That is only enough for one-way traffic. (Page 8.) Given the amount of time that it will take ships to pass through the two three-chambered locks, that means about 14 transits per day. (Page 72.) That is reasonable. 14 transits per day means 103 minutes for a ship to transit one set of locks. (Only one ship can through the locks at once, but there can be a ship in both the Brito and Camilo locks at the same time.) The new Panama Canal lock chambers are designed to take about ten minutes to fill or empty; call it an hour then for each transit, plus 40 minutes to enter and leave. OK, then. In 2020, HKND expects 3,576 transits, rising to 4,138 by 2030. (Also page 72.) That’s about a third of the roughly 12,000 recorded by the Panama Canal. So it is certainly a plausible number. If you ever wondered what a Panamax container ship looked like going through the Miraflores locks, well there’s one right behind me in the picture up there. That’s a ship, not a warehouse. Yes, the current locks are a tight fit. Now imagine one three times the size. So let’s calculate a ridiculous upper bound for the Nicaragua Canal. Assume that all the container vessels are at the maximum size for the new passageway. At the current rates charged by the Panama Canal, that’s $1.4 million per container transit. Then assume that all other vessels (save tankers) are equivalently oversized. That gets you about $500,000 per dry bulk transit and $1.1 million for vehicle carriers. We’ll further assume that all the “other” vessels in the HKND report are vehicle carriers. For crude oil, imagine that everything is a ULCC with almost 7× the capacity of a Panamax tanker. Ditto the LNG ships. Refined products, on the other hand, are currently shipped in Panamax-sized vessels, so even in this silly projection we’ll leave them the same. What do we get? A real internal rate of return through 2030 of negative 1.8%. If you take it out to 2040, then you can eke out 4.1%. A steely investor willing to bet against global war, the Singularity, and the chance that climate change will open the Northwest Passage could get 5.6% through 2050. If this thing gets built, it will not be to generate profits for shareholders. Rather, it will be because the Chinese government sees some sort of security benefit. But other than, I dunno, access to the natural gas that the United States is not going to export in large amounts I could not tell you what that might be. In this case, I mean that quite literally. The planned route of the Canal Rojo appears to have taken a small twist in response to either local opposition or ecological concerns, take your pick. The announcement came last Saturday in an almost offhand manner, with no details. Here is a close-up of the original route, as stated by HKND. El Tule is the town that protested vociferously. The blue-striped area is a Ramsar-designated wetland. (Ramsar is a U.N. convention that protects wetlands; negotiations finished in 1971 and the convention came into force in 1975.) The brown-striped areas are where HKND intends to dump material from the canal excavation. On January 15th, a Ramsar delegation arrived to study the effect of the Canal on the San Miguelito wetlands, which would seem an odd thing to do if the Canal was now expected to bypass them. (Here is a link to the July 2014 presentation by ERM, which confirms the above route ... and says that HKND intends to consult with Ramsar over compensation for the wetlands, not over how to avoid them.) Below is a map from Nicaragua Dispatch showing the new dog-leg in the route, although I am not sure where they got it from. It all seems a little ad hoc for a $50 billion project that has supposedly already started. Below is the most detailed map that we have yet been able to find of the route of the Gran Zanja. I have to admit, an adolescent part of me hopes that I am wrong about the project. Because it really would be freaking cool if it were built. This would be a comment on this post at Bloggings by Boz, but goddammit there’s no way to comment over there! What up with that, Boz? Would it will be so easy. For as we pointed out here, Nicaragua has signed away its sovereign immunity in the concession agreements. I doubt that the more extreme renunciation will stand in foreign courts ... but the Chinese won’t even need that to hold future Nicaragua over a barrel. I suppose that the United States probably could arrange things to help the Nicaraguans escape the deal. Maybe. Perhaps. Uh huh. Meanwhile, y’all can listen to me bloviate about why I don’t think the Nicaragua Canal will happen on the BBC World Service. This blog was confident that the Nicaragua Canal would not be built because it makes no business sense. That is still our position. That said, it is increasingly likely that construction is about to start on ... something. We would still bet against that something being the Gran Zanja. If Beijing has decided that the People’s Republic has decided that a Nicaragua Canal, then one of the biggest arguments why it will never happen goes away. Second, construction is due to begin on December 22nd. But don’t get too excited. The first works will consist of “auxiliary roads and port construction, not the ditch.” Other announcements have omitted the port construction; it looks like the work might be just sixty miles of macadamized roads. Even HKND admits that the December 22nd date is symbolic. It is worth noting that while Nicaragua can probably provide the meat, it would need to import most of the rice and a lot of the vegetables. In short, a serious effort will see massive imports of food and construction materials, as well as mass hiring of Nicaraguans and the arrival of thousands (if not tens of thousands) of Chinese workers. It won’t start on a dime. Third, there is a lot of opposition in Nicaragua, not least because the new law says that landowners will be compensated at the cadastral value of their land, not the market value. The Changjiang Institute has been conducting surveys around Rivas, and the Chinese surveyors have needed police and military protection. And you can add to the opposition to mass expropriations three other things: (a) opposition to the potential arrival of thousands of Chinese workers; (b) opposition to the Panama-Canal-Zone-like 500-meter security zone on either side of the canal; and (c) general opposition to the renunciation of Nicaraguan security. It is not clear that the domestic politics of the project will hold up. We return to our initial conclusion: the Nicaragua Canal is about the side projects. Look at this presentation. The side projects are much more developed than the Canal. (The map above shows the port complex on the Pacific, which will in effect be a Chinese charter city.) HKND is enveloped in a web of weird related companies that seem perfectly designed to channel profits to Nicaraguan politicians but not so much for raising $50 billion. In short, while it is possible that Beijing might throw its weight behind the Gran Zanja (also sometimes evocatively called the Canal Rojo) we remain skeptical. Andres Oppenheimer of the Miami Herald (who wrote what was my favorite book on contemporary Mexico, until overtaken by events) is also skeptical that the Nicaragua Canal will be built. His worries come not from the contract, but from the shadiness of the deal, rushed through the National Assembly. First, he argues, Wang Jing, the owner of HKND, has no construction experience. Second, Ortega’s son, Laureano, has “chaperoned” Wang around the country. Third, there was no public bidding. He could have added that Wang’s telecoms company, Xinwei, recently landed a $300 million contract to build a 4G network in Nicaragua (without propper bidding) and is building (with Great Wall Industries) a communications satellite for a 2015 launch. It is a little shady ... but I would not doubt the deal because of that. Xinwei is reputable enough to raise the capital and hire the expertise for a commercially-viable project, even if they might not have been the prime contractor under a more open process. Moreover, as Oppenheimer points out, a lot of reputable Western firms and individuals are pinning their names to the project. So I am not worried that the Canal might be smokescreen because of Xinwei’s odd relationship with the Sandinistas and President Ortega. Rather, I am worried that the Canal is smokescreen because it makes little economic sense while the contract allows HKND to build all sorts of other lucrative stuff under 19th-century concession terms. An American company that has been trying to build a transcontinental railroad since 1995 shares my worries: it is going to be locked out of the project. For what it’s worth, Nicaraguan public opinion is very favorable. And the truth is, unless your property happens to be expropriated, it is unlikely that the project will make Nicaragua worse off. Sure, the FTZ’s will bring less benefit than hoped, and the railroad will generate few spillovers and little public revenue, but it is better than nothing. After all, the American dry canal project has gone basically nowhere for almost two decades and President Ortega is popular. So why not? If I were nica, I’d also support rolling the dice on the project, even knowing that it much more likely to end as a big real-estate deal and quasi-charter city rather than a Nicaragua Canal. Lastly, a brief revisit of the Panama Canal issue. Below is a map from the Panama Canal Authority showing where a fourth set of locks (i.e., the expansion after the current expansion) would go. Here is the design proposal for a new bridge over the Panama Canal, which specifically states (on page 9) that the bridge must be tall enough to handle the bigger ships from an as-yet-unbuilt fourth locks project. In fact, in 2008 the U.S. embassy in Panama reported that Roberto Solange, then the Panama Canal Authority’s VP of marketing, wanted to run a feasibility study on a fourth set even before the third was finished. In short, the threat of a second Panama Canal expansion is very real ... and should dissuade rational investors from a full-scale Nicaragua Canal. As opposed to a smaller railroad-port project. Does HKND really want to build the Nicaragua Canal? Probably not. “Wet Canal,” e.g., the canal. But clause 15.1 allows the Sponsor (i.e., HKND) to walk away from any of the subprojects at its own discretion. If in respect to a sub-project, at any time prior to closing the finance for said sub-project, the relevant Sponsor determines by its sole discretion that such sub-project is not viable (for commercial, technical, legal, political or other reasons) or that the sub-project should not be completed or operated, in such case, the Sponsor has the right to terminate the concession for such sub-project and all rights, benefits and obligations under this Agreement with respect to such sub-project. The chart on page 21 of the agreement makes it clear that there is no special penalty for declaring a sub-project inviable and walking away. In other words, HKND could develop, say, the railroad and free trade zones, or the airport and pipeline, or just the railroad, or just the free trade zones, or whatever ... with all the amazing protections and concessions that I discussed in this post. You could see a de facto pair of HKND-run charter city ports (depending on the specific FTZ legislation; all we know right now is that they will be tax-exempt and operation outside Nicaragua’s tariff wall) with a railroad and pipeline connecting them. That might make commercial sense as a project; I can especially imagine the pipeline getting use for Venezuelan and Brazilian shipments. But I do not think that HKND really intends to build a canal. Oh, I am sure that they might try if the financing showed up ... but I don’t think that they will try very hard. So I got my hands on the memorandum of understanding, the deed of cooperation, and the framework agreement for the proposed Nicaragua Canal. All I can say is ... wow. It is somewhat, uh, lopsided. Thus my political doubts about the proposal. This is such a stunningly bad deal for Nicaragua that I have trouble imagining it lasting. But then again, Mr. Ortega has run the place tolerably well and is riding high in the polls. His party has total control over the National Assembly and the next election is not until 2016. So maybe he can get it through, although something about this statue in downtown Managua gives me doubts. On to the deed of cooperation! First thing, it establishes free trade zones at both ends under the control of the concessionaire. It is supposed include an international airport, or if that doesn’t happen, control over an expansion of an existing one. Third, the concession period is 100 years. Nicaragua shall grant ProjectCo the right to use and receive any and all economic benefits arising from the Canal and the Associated Infrastructure (including without limitation the exclusive right to collect tolls, tariffs and fees from the shipping and freight utilizing the Canal and any party utilizing the Associated Infrastructure) for the period starting upon the date hereof and ending on the date which is fifty (50) years after the commencement of operation of the Canal, which initial term shall be automatically and without any additional consideration from or costs to the NewCos or the Sponsor extended thereafter for an additional fifty (50) year period in the event that ProjectCo provides a written notice to the Authority at least six months prior to the expiration of the initial concessional period. ProjectCo is a special purpose vehicle (formed under the laws of any country) to operate the Canal. The Sponsor is the HKND Group. The Authority is a semi-autonomous arm of the Nicaraguan state established by Law 800. NewCos refers to both ProjectCo and the holding company that will own the shares, e.g. HoldCo. Let us continue. Anything else? The Authority and Nicaragua shall grant protections and safeguards to each of the Sponsor, HoldCo and ProjectCo against any changes in law (including, without limitation, tax, corporate and real estate laws of the Republic of Nicaragua) law enforcement, environmental standards, consents, decrees, policy and regulations and any court order, decrees or judgments. The Sponsor and each NewCo shall each enjoy exemption from Nicaraguan corporate and income taxes and exemption for themselves, their affiliates and financing sources and the Project from all charges, fees, withholdings and assessments and any other taxes and duties. But how can HKND be sure that a future Nicaragua government won’t change the rules? Well, they are planning for the year 2113, so maybe they will just send in a robot army. But that seems like a long-shot. So instead they promise to give HKND the protection of Nicaragua’s bilateral investment treaties. See the above clause where the NewCos could incorporate where they like? That means they get to pick the best one of Nicaragua’s treaties, which you can find here. And that brings in the power of ICSID. Already Nicaragua would be risking Chinese retaliation. (Qianru Song and Rodrigo Wagner have argued that China worries little about expropriation because it stands ready to use harsh economic sanctions against violators.) But now it would risk huge legal knots from every country that had signed the New York or Washington conventions. So far, we have that the Nicaraguan government gives HKND full property rights over the Canal for 100 years, including title to all property, plus a form of extraterritorial privilege in the free trade zones. Plus full tax exemptions and recourse to international law to make sure that nothing but nothing changes between now and 2113 ... actually, a bit longer, since that 100-year clock starts ticking when the Nicaragua Canal starts operation, estimated by proponents as eleven years after construction starts. The framework agreement adds a few wrinkles to the deed of cooperation. It has a few provisions that could be interpreted as giving HKND the right to set up its own security service. It also insures that arbitrations will occur in London, and that is important because London has some of the most powerful laws to use against international entities. (Arbitral decisions are first enforced in the country where the tribunal was held.) And it makes it clear that HKND can bring in whatever workers it needs to construct and operate the canal. [The Republic of Nicaragua] waives to the maximum extent possible whatever sovereign immunity that it might possess, whether before an arbitral tribunal or procedure, judgment, jurisdiction, adjudication or enforcement action, including the waiver of any sovereign immunity for itself (including, should it be applicable, its ministries, departments, agencies and independent organizations carrying out governmental functions) and whatever of its properties, whether its own or any other agency, regardless of the commercial or non-commercial nature, function or purpose of such property. These assets shall include any bank account belonging to the Party [e.g., Nicaragua] whether under the name of a diplomatic mission or something else. This all seems very familiar. I mean, there is no reference to a zone ... uh, except the free trade zones, and that’s different, right? ... and I don’t think that Nicaragua will be adopting the yuan or changing its constitution to allow Chinese intervention ... but wow. For what it’s worth, that $10 million is more than the $5.4 million (in 2012 dollars) that Panama received from the U.S. under the Hay-Bunau Varilla Treaty. But this is set up to insure that Nicaragua will enjoy very little benefit from the canal until its second decade of operation, and even then the returns will be slight unless it turns out to be phenominally profitable. Putting aside the problems with the business case (you can read HKND’s version here), I am not sure how you sell this contract to the Nicaraguan people. But perhaps President Ortega is popular enough and has a big enough majority that he does not have to. Finally, two useful links. Here is a good news backgrounder by El País. Here is an invaluable run-down of the Chinese actors and the legislative background at Margaret Myers’ always invaluable China and Latin America blog. Courtesy of Damien Cave’s twitter feed, I found this 2006 article from Matthew Power. He took a canoe down the San Juan River, the most-mooted route of the new Nicaragua Canal project. I want to go! Although I will probably take the motorboat. I just had a bit of a tussle with climbing in the rain, following a boxing match gone wrong. As a 40-something father, I think I might be done with the macho tip. Maybe. I hope. Anyway, go read the article! It is a very good travel piece, and if it doesn’t make you want to go, then nothing will. Of course, considering as I believe my own argument, there is no rush: the river will be there and be green for a while to come. UPDATE: Yes, an update before I even hit “publish”! It appears as though the HKND group has ruled out a San Juan River route. Smart! I still do not think it will happen, but the probability of success just ticked up a tiny bit. Short version: Nicaragua will be competing with the expanded Panama Canal, climate change (opening the Northwest Passage), and the fact that Panama has built its new locks to make expanding again relatively easy. Even if you believe that the Nicaragua Canal is feasible, it makes little sense to go up against that sort of competition. Let me explain with some pictures. Behind me you can see the new Panama Canal channel under construction. The photo is looking north. This is a view from the other direction. The berm will be knocked down and the entire area opened to water. Note the width. It is wide. Much wider than you need for one new set of locks. The below picture looks north at the new locks under construction from what will be the approach channel. To the right of the concrete construction will be the water-saving basins. To the left is a lot of empty space. Moreover, Panama decided not to build the third locks bigger. They could have. But the Canal Authority decided that building something that could handle most Suezmax ships would be good enough. In addition, most U.S. ports need work to handle the new size (called NPX or post-Panamax) ... and many analysts think that cargo ships have already gone past their optimal size. And while we do not yet have the plans for the new canal, we do have the plans that a Nicaraguan commission published in 2006. Those plans called for locks with dimensions of (in feet) 1,529 × 210 ×112. That is deeper but not that much larger than the new Panama locks, which come in at 1,400 × 180 × 60. The builders of a Nicaraguan Canal therefore would be taking three bets: first, that the increased size would attract a lot more traffic; second, that the Panamanians would not match them with a fourth set of larger locks; and third, that if either of the previous bets went wrong there would still be enough traffic for both canals. Given all that, I would not invest $40 billion in such a venture. I have other reasons to doubt the project, but they are political. The above captures my skepticism about the business case. Thoughts? It seems as though the Argentine ambassador in France will no longer need to pay embassy expenses out of his own pocket. A French judge lifted the freeze imposed on April 3rd. More importantly, a German judge released the funds that German companies owed Argentine tax authorities. Interestingly, Judge Wölber did not base his decision on sovereign immunity. Rather, he ruled that since the tax payments were owed by the companies’ Argentine operations, German courts had no authority. It remains to be seen if this precedent will be followed by other European courts, but the Argentine government is optimistic. Interestingly, U.S. courts have taken the same position. In 1999, the New York-based Leucadia National Corporation sued Nicaragua over $26 million in defaulted debt that it had purchased for $1.14 million. A New York court granted the company $87 million. (No, I don’t know why.) It tried to collect by attaching Nicaragua’s share of the ticket and landing fees paid by U.S.-based airlines that flew to that country. U.S. courts, however, refused to uphold the judgment. But don’t cry for Leucadia. Eventually the World Bank paid off the debt at 4.5¢ on the dollar, including accrued interest. By my calculations, Leucadia received about $7.8 million, for a nice return of 584%. I am increasingly unsympathetic to Argentina. But I am also relatively unsympathetic to the vulture funds that try to use the judicial system to impose sanctions on defaulting governments. I may change that position if we start seeing more ploys like President Correa’s brilliant gamble, but that’s still a hypothetical fear, not a real one. Peter asks about past Nicaragua canal plans; Randy asks about the environment and Costa Rica. 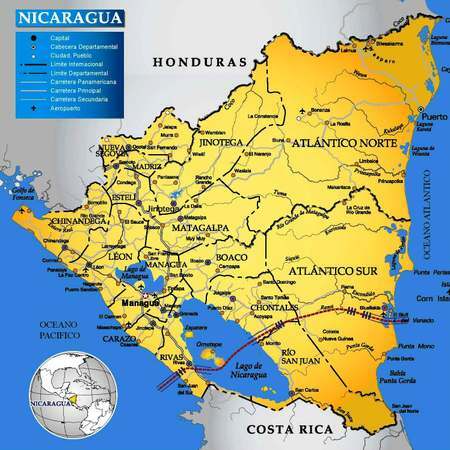 Nicaragua was in fact considered for a trans-Isthmian canal. Only one project got past vaporware: between 1887 and 1893, the Maritime Canal Company excavated 1½ miles of canal and built 11½ miles of railroad in pursuit of the project. Their planned route to the Atlantic followed the dashed line above. Meanwhile, their plan to avoid the rapids and shallows of the San Juan River east of its junction with the San Carlos River was brilliant in its simplicity, if not in its feasibility: build a giant dam at Ochoa and flood everything all the way to Lake Nicaragua. It turned out that the land slopes pretty shallowly to the south of the river, which meant two things. One, Costa Rica needed to be paid off. Two, giant embankments needed to be constructed, which drove up the cost. The Maritime Company went bankrupt. When the U.S. government started to seriously scout routes in 1901, it identified the Nicaragua route as feasible, but significantly more expensive. It estimated that a Nicaragua route would cost $189 million versus $144 million for a canal through Panama. How much is that in real money, you ask? (Well, maybe you didn't, but you should.) In 2007 dollars, the Nicaragua route was estimated at $4.0 billion, while they figured the Panama route would cost only $3.1 billion. But that doesn't tell you how much effort they planned to put into the project, because the world was much poorer back then. Equivalently-scaled projects today, relative to the size of the economy, would cost $117.7 billion and $89.4 billion respectively. A $28 billion difference ain't nothing to sneeze at. While there were many political twists and turns (including a lot of politicians with a vested interest in the Panama route), at the end of the day that was the reason Panama got a canal and Nicaragua did not. In 1931, the U.S. once again considered a second canal through Nicaragua. These plans were rather less environmentally destructive. (See the solid line on the map.) There would still be a dam and some flooding, but very little compared to the 1887 plan. Most of the rapids would be bypassed by short stretches of canal. This plan, of course, didn't come cheap: $722 million in 1931 dollars, or $8.4 billion in real money, or $130.3 billion as a percentage of national income. Considering that the Panama Canal had run over-budget by at least a factor of 2.5, those estimates seem a bit low. Then again, a bad recession was in the process of turning into the Great Depression, and people were willing to work for smiles. So you never know. Anyway, the plan never happened. Although the Panama Canal had been a huge economic success, there wasn't much of a case for expansion. The military case was equally dicey. Costa Rica was also dead-set against it. In fact, the Central American Court of Justice died in 1917 precisely when Costa Rica protested over Nicaraguan canal plans, arguing that an 1888 arbitration reward (decided, ironically, by President Grover Cleveland) gave it a veto over canal plans. Nicaragua told the court to f*** off (meaning that the United States told the court to f*** off, since the U.S. effectively ran Nicaragua at the time) and that was the end of that. But I haven't yet answered Randy's question about Costa Rica. The new canal plans, you see, don't involve the San Juan River at all. The Nicaraguans evaluated six possible routes, and selected the one shown above. They rejected the San Juan route because of the cost of the dams and the ecological damage they would cause. They rejected two routes that would plug into the Escondido River for the same reasons. Finally, they rejected two cross-country routes to Punta Gorda (more-or-less) because they were simply infeasible given the terrain. In other words, because technology has changed, the environmental and political objections are less than they once were. Still, with an estimated cost (in 2006) of $20-25 billion and a worldwide recession gathering force, I don't see this thing happening anytime soon. I wouldn't discount it forever, of course. Traffic between Brazil and China will only grow, and despite the trans-South American road and rail links now under construction a second Isthmian canal might become something reasonable. In addition, if oil prices rise further (something I'd bet against, but I've been wrong), then our friend Hugo might decide that this is just the investment to bank his spare change in. After all, the Banco Central de Venezuela is sitting on $39 billion in reserves, and it would make his dream of exporting to China instead of the U.S. much more feasible ... but no, I don't think he's that irresponsible. Somehow I just don't think that this is going to happen. I mean, it's nice that Managua recognized South Ossetia and Abkhazia, but Russia just doesn't have the money right now. No, if you're going to reward your faraway friend (although I'm at a loss as to why Moscow would want to) this seems like the way to do it. And much as Nicaragua is a full-up member of the Alternativa Bolivariana, Venezuela doesn't have the money to toss away on such a megaproject right now. Astoundingly enough, Caracas is going to have to cut back spending if oil goes below $90, a level of fiscal irresponsibility to rival Washington. Still, for a guy who proposes transcontinental railways and really likes to build stuff, I'm surprised that a Nicaraguan canal hasn't caught his eye. Another thing that I didn't quite realize until I got to Venezuela is just how important the international dimension of the Bolivarian Revolution is to President Chávez. 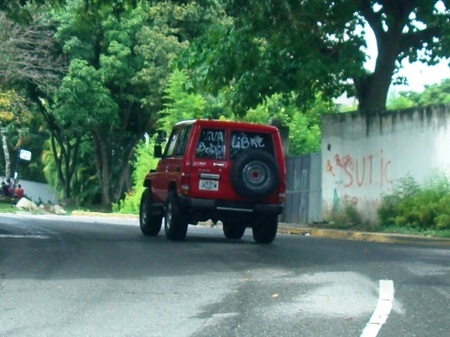 The above photo is of a speeding red jeep, of the sort that Chávez has distributed to various functionaries, with “Viva Bolivia libre” painted on the back window. We were up in the “Country Club” neighborhood, a wealthy part of town where the government planned to build public housing until Chavista supporters started buying homes in the area. Those plans, mysteriously, now seem to be on hold. It was a Saturday, the day before Bolivia's recall referendum. Chávez is deeply vested in Evo's success, and so he organized mass demonstrations in support of Evo Morales here in Caracas. Parts of the city were a sea of red, gold, and green, and Evo supporters could be seen everywhere. It formed a decent counterpoint to the opposition demonstration held on the same day. Bolivia is a member of the Alternativa Bolivariana para las Américas (aka, ALBA), along with Nicaragua, Dominica, and Cuba. Honduras is on the verge of joining. It isn't entirely clear what ALBA does (there's not a lot of institutional heft to it) but the Venezuelan government has vested a lot of rhetoric. It also seems to have invested no small amount of money. A back-of-envelope calculation from data in this Miami Herald article implies that subsidies to Cuba alone are worth around one billion dollars a year. Information in this Reuters piece implies an even higher cost: 34 million barrels a year, worth around $4 billion, in exchange for Cuban doctors. Chávez has given aid to Bolivia and Nicaragua under ALBA, purchased billions and billions of Argentine debt in support of the Kirchners, and finances oil purchases in the circum-Caribbean. There are two mysteries to Chavista internationalism. First, what's its extent? How many resources has Caracas put into spreading Bolivarianism? Second, what does President Chávez get out of it? Neither one has a clear answer, but I'll take a very superficial stab at it. The easiest program to pin down is Petrocaribe. It offers cheap loans to circum-Caribbean nations to finance oil imports. As the price of oil grows, the buying nations get to finance a larger percentage of their imports. (60%, as long as oil stays above $100.) The loans are made for 25 years at 1%. The actual value of these subsidies is hard to find. The Venezuelan government announced that Petrocaribe members saved $14 per barrel on 59 million barrels over the last three years, for a total of $826 million, but God only knows how that was calculated. If you assume that (1) Venezuela meets its Petrocaribe commitment of 185,000 bbd, (2) the average cost of oil is $110, and (3) Petrocaribe members can borrow on the open markets at 7%, then the value of the program comes to $223 million per year. What about direct financial aid from Venezuela? That's even harder to find. The Venezuelan budget website doesn't seem to be working. Venezuela buys plenty of Argentine bonds (more on that in another post), and Caracas lends plenty of funds to various Latin American states through a panoply of aid and investment programs, but there's no central registry. Nor is it clear how such financial aid would be booked in the balances-of-payments published by the receiving nations. I heard a lot of rumors that the Venezuelan embassy in Bolivia has a budget of $500 million per year. That would be an astounding figure, considering that the entire Bolivian government barely manages to spend $1.5 billion, but it's impossible to verify. The Bolivian balance-of-payments registered less than $300 million in official transfers in 2007. Most forms of unbooked aid should eventually show up in the erros & omissions category of the balance-of-payments, but that category is small and shows no trend. (Bolivia, unlike Venezuela, has very easy-to-use statistical websites.) Bolivian officials admit to about $50 million in unofficial Venezuelan support, channeled directly to local officials. If the Bolivarian Republic provided services that aren't booked in the trade data, like, say, a small army of Cuban doctors, then that wouldn't show up in the receiving-country's statistics. Venezuela could also, say, overpay for its imports from favored nations, or finance development projects, none of which would be booked. In other words, estimating the value of Venezuelan aid would take a lot more time than I have available. Amazingly, Venezuela also gives help to the U.S. and U.K., providing cheap heating oil to poor Americans in the northeast and subsidizing bus fares for poor Londoners, at least until recently. The cost of those programs, however, isn't very high. And then, of course, there is the $300 million that Caracas may have provided the FARC. Doug Muir, I should point out, predicted that Chávez would "meddle" in just this way. (Can anyone find that link?) The recent near-war combined with the FARC's troubles, however, seems to have the kibosh on that. An American intelligence official told Congress that Venezuela has spent $33 billion to influence his neighbors, but he gave few details. I don't trust the number, but it is within the realm of possibility, if you include purchases of Argentine bonds. In short, it's clear that Venezuela spends a fairly substantial amount on aiding other Latin American governments. (Or, in the case of Colombia, trying to subvert them.) So what does Caracas get out of its involvement? On April 1st, 2007, the Stabroek News of Surinam reported that Dominica had finally caved in on the Aves Island issue. Now, that sounds like a pretty concrete gain ... only a high-placed Trinidadian official in Caracas pointed out to me that the U.S. and France had already recognized Venezuela's claim. 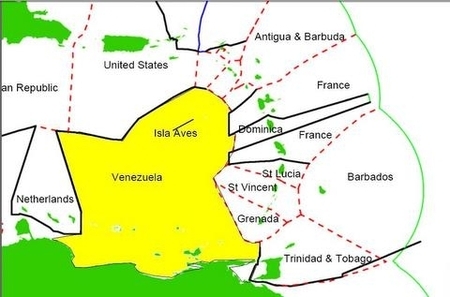 (To be fair, both countries hold that possession of Aves Island would not allow Venezuela to claim a Caribbean EEZ.) In point of fact, Dominica has not revoked its claim, and the Dominican opposition is fighting the construction of a Venezuelan-financed fuel refinery, fearing the expansion of Venezuelan influence. Mr. Chávez has discussed building a pipeline across Nicaragua, in order to export oil to China. After all, it currently takes four days to transport Venezuela crude to the United States, and four weeks to get it to the People's Republic. On the other hand, it takes special refineries to process Venezuela crude, and it still wouldn't make sense to sell to China instead of America even with a Nicaraguan pipeline. So nothing has happened there, and all Caracas seems to have gotten is Mr. Ortega's rhetorical support at Ibero-American summits. What about Bolivia, whose referendum kicked off this post? Venezuela has signed a defense accord, of sorts, and Bolivia is a full-on supporter of ALBA and Venezuela's other unity initiatives. But the country isn't about to become a Venezuelan colony, and Chávez isn't going to get Bolivia (or any of the other beneficiaries of his largess) to subsume its sovereignty in some sort of great Bolivarian Federation. At home, the benefits are equally hard to see. On the margin, Chávez gets some props from his association with Fidel Castro, but is that worth one (or four) billion dollars? His supporters don't vote for him because he helps keep exposure deaths down in the Bronx or prevent diarrhea in Bluefields. In short, his initiatives aren't providing much concrete benefit to Chávez or his constituents. Nor do they seem to be laying the groundwork for a serious attempt to unify parts of Latin America under Venezuelan leadership. I'd understand either one. But if I'm correct, and neither goal applies, then he must be spending all this money out of ... pure charity, pure ego, or both. That's a bit unsatisfying, of course. I may be blinkered by my own realism. I must be missing something. Any ideas or better analysis out there?